We are so excited for these! I’d say we’ll start serving towards the end of next week. After the Corsair tasting. they will be offered as chilled shots or with soda water. 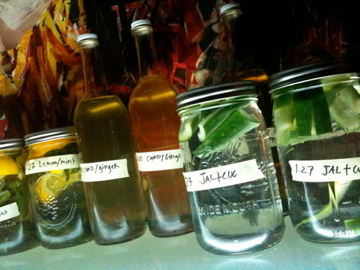 We have Meyer lemon/mint, kumquat/black pepper, Ginger/cardamon vodkas, and jalapeÃ±o/cucumber tequila! Thursday’s cocktail at the Public House is one of my all time favorites. Bitter and sweet and beautiful!! Chartreuse is made by monks is one of those liqueurs that has a gazillion herbs resulting in a very complex flavor. A little goes a long way! Pour gin, Chartreuse, liqueur, and juice into a mixing glass. Add ice cubes and shake vigorously. Strain into a cocktail glass. Recipe from Speakeasy, the Employees Only bar recipe book. Mockingbird, Downtown Wine and Spirits, and the Public House are super excited to host Corsair Artisan and offer up some awesome cocktails featuring their “micro batch craft spirits” and bitters from The Bitter Truth. These are some amazing products and are all available at Downtown Wine and Spirits and will eventually be a fixture at the Public House. Because these guys make small batches they are able to experiment and refine the flavors of their spirits. So far I’ve only tasted the Gin but it is super clean and smooth and lovely. Over the holidays I mixed it with a splash of Dimmi and a few dashes of the Bitter Truth Aromatic bitters. Which leads us to the bitters for the eve. As the craft of creating and perfecting cocktails has swept the coasts in the past 5 years, so have the availability of bitters. One of my dearest and most inspirational food friends exposed me to a selection at her Italian market out in Sacramento CA about 3 years ago and I have been a convert ever since. From Rhubarb, to Whiskey Barrel, to Celery, bitters are like little dashes of flavor brightness for your cocktails. The Bitter Truth bitters are part of this flavor revolution. These guys are based in Germany and produce 8 kinds of bitters plus a handful of experimental bitters produced for exclusive hotels or bars. They have some great recipes on their site but the best way to start working with bitters is to taste a few dashes in Champagne or chilled Vodka (I really just like anything with Champagne, it’s probably not the best way to a get a real sense of the bitter flavors since Champagne is not neutral, but it is the fastest and easiest way to make an awesome cocktail!) Once you’ve tasted you can start experimenting with different ideas! There is no admission, flights of the cocktails will be available for purchase and Corsair will be there to answer any questions about the distillery, the distilling process, and their spirits. From the Employees Only Speakeasy book! Come taste it at the Public House on Thursday! The whiskey, lemon and simple syrup are shaken in a shaker and poured in a rocks glass over ice. The Malbec is floated on top of the drink. We’re super excited that Avanti Savoia is partnering with us on the Olive Oil tasting. They will be providing the other 2 oils to round out the tasting platter. Cassini Gran Cru Extra Virgin Olive Oil 500ml has a very fine taste, with note of artichokes, lettuce, and a hints of basil and parsley, with a fruityÂ after taste with mellow hints of ripe white apples, pine nut and dried fruit, harmonic bitterness. Marcinase fruttato intenso Extra Virgin Olive Oil has ample vegetal notes of artichokes, wild thistle, chicory, mint and rosemary, with a spicy after taste of black pepper, dried fruit and a distinct almond finishing, bitterness is difinite and pungency is present. One of the thing that interests me about food is, well, all the interesting people doing interesting things with food both at home and in business. Over the next few months Mockingbird will send questions to different food people for different reasons. Charlie Jennings is a former co-worker of mine. His blog CharlieTuna is one of my favorites. Below he talks about his food experiences. What do you remember about eating growing up? As far as eating out goes, it was McDonald’s hamburgers, pizza, chicken nuggets, “Japanese” food or Outback Steakhouse on a special occasion, and so on.Â I still get those things occasionally for the nostalgia…not so much the nutrition…. I spent a lot of time at my grandparents’ house on my dad’s side of the family until I was about 15, so the food I ate there is really strong in my memory.Â A few highlights were cubed steak, chicken & dumplin’s, biscuits, pork schnitzel, and all sorts of awesome side dishes, especially the green beans.Â My mom’s mom’s cooking is equally vivid in many ways, but a little more recently.Â Both families resided in upper East TN and served “country cooking,” but my grandmother on my mom’s side serves a “cleaner,” slightly healthier country cooking.Â You know, olive oil in the beans instead of butter, but with equally great flavor.Â They have a farm in Joneborough, TN, so I’ve had a lot of great farm-fresh vegetables there.Â I loved (and still do) their corn, Cherokee purple tomatoes, potatoes, Asian pears, Concord grapes and more. Of course, I remember my mom’s food.Â I loved her spaghetti and red meat sauce, chicken and rice casserole, Christmas jam pasty, and all sorts of other stuff.Â I still enjoy all of that today. I miss some of the unique food spots in Bristol area…Blue Circle hamburgers, Ed’s Pizza Parlor, Ridgewood BBQ, and others. There’s many things I credit with it, but I imagine it has a lot to do with food being a key part of holiday celebrations with both sides of my family and watching food TV when I was younger.Â There was once a show on TLC, I think, called Great Chefs of the World.Â It was a 3 part show, if I remember correctly, that featured a dish from three different chefs from different parts of the world, mostly Europe.Â I watched if after school, I believe.Â Then, in the early to mid-90s I started watching the Food Network in its early stages.Â That’s when it was just Mario Batali, Emeril Lagasse, and others cooking in a kitchen in their white chef’s jackets – no B.S.Â It was more instructional than entertainment. That’s changed, obviously.Â Julia Childs, Graham Kerr, and Martin Yan were still on Public TV at the time, so I watched those, too. Favorite album(s) to cook to? I am still working on a kitchen audio solution, honestly, but it’s usually something ambient or jazzy or soulful, not my longtime favorite type of music, i.e. heavy metal, but something more soothing.Â Metal takes too much of my attention. Three-four restaurants you want to eat at this year. I want to go to Blackberry Farm.Â I am hoping to do that for my birthday. I’d like to go to one of the new hot spots in Atlanta, maybe Miller Union or Holeman & Finch. There’s some great new places in Vegas getting excellent press, so maybe one of those. And then there’s a handful of places in Knoxville, like Chez Liberty or Kaya Korean, that I’ve said I would go to but haven’t yet.Â I usually stick my standards.Â I need to expand locally. Favorite kind of dining experience? Other than that, it’s just good food, no matter where it is served – on the side of a road, like a taco truck in California, or in a shopping mall, like the Asian restaurants in Vegas’ Chinatown. Favorite kind of cooking experience? It’s definitely cooking in my kitchen with a bottle of wine open and with really good ingredients that came from the store that day.Â If I’m being lazy, I like things I can prepare quickly on high heat, either on a grill or in the oven, but if I am fully committed, then I like something involving more technique, like a risotto or homemade pasta and red sauce. I’m SO excited about our first venture into cocktails at The Public House!!! February 2 from 6:00-8:00 join The Public House, Downtown Wine and Spirits, & Mockingbird Events for a tasting of Corsair Artisan Distillery and The Bitter Truth bitters. Jason Ingram from Corsair will join us. Meet the makers and enjoy some creative cocktails! The tasting is open to the public, cocktails will be sold in flights, no advance tickets are necessary. Tell all your drinking buddies! Posted in Uncategorized | Comments Off on Corsair Tasting!